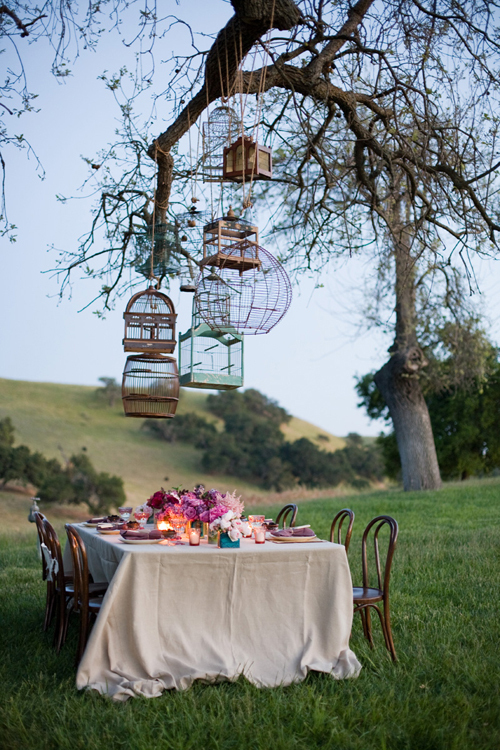 It is a bit unusual but I like how these old birdcages are used for the styling of a wedding shoot. I too Love these birdcages!! I think they are so charming… I would put candles in them as well. precisely what i was looking for. down to the tee. i have chills, it’s so pretty. Like Jennifer I thought of putting tealights in them or some sort, then they would be a perfect chandelier. i bought a beautiful wooden birdcage in hong kong but really don’t know how to use it as a design piece. Love this image, so very sweet. Skimachigato, hang the bird cage in the living room filled strings of ferry lights. I love your ideas to put tea lights and ferry lights in the birdcages! Thanks for your comments and sharing your ideas. Unusual? Yes! Love? Yes! Thank you so much for the link back, Danielle! I love your blog! Just beautiful. And stunning photo. what a beautiful idea. so pretty!